As a youngster, I never imagined that I’d be telling people how I’ve performed certain exercises for over 30 years. But here I am in my 40s, and I’m doing just that. As stated recently, my training has remained largely the same for many years. Yet, just because I tend to stick with movements that are familiar to me doesn’t mean that I no longer strive to improve. And that’s an important distinction to make based on one reader’s comment about my last post. The assumption from this comment could not be further from the truth, but it also warrants a further discussion. I’ve never met anyone who was opposed to becoming better (regardless of the goal). I certainly welcome any gains that come my way. I am however cognizant of the fact that gains don’t come as often to those who’ve trained consistently for many years. And the reason for that is quite simple. As you gain strength, it becomes more difficult to continue adding to the strength you’ve already developed. For example, the strongest person in the world needs to work incredibly hard to become stronger. On the flip side, a beginner is much more primed to improve. I’ve even joked that a beginner could look at a barbell and gain strength. They can do almost anything in the gym and improve simply because they are starting from a lower level than a seasoned athlete or lifter. Once again though, just because gains don’t come as fast to those who’ve been around the block doesn’t mean we aren’t still trying. We should always strive to improve. Furthermore, it’s important to understand that maintaining the gains you’ve previously developed is an important part of training. Maintenance should not be viewed negatively. Being able to do the same things I did years ago feels just as good as any gain I ever made. For instance, below is a brief example of a pushup flow that I recently shared. I demonstrated the exact same flow back in 2014 on YouTube. I can’t definitively say that my hands and wrists are stronger today than they were four years ago, but I do know that they aren’t any worse. At minimum, I’ve maintained the same lower arm strength and flexibility that I had before. In my eyes, that is progress. The take home lesson here is quite simple. We should all strive to improve, but also work hard to maintain what we’ve already built. Because like it or not, what goes up will eventually come down. Thus, if we can delay that descent, we’ve essentially turned back the hands of time. In summary, don’t beat yourself up if you aren’t making constant gains week after week. 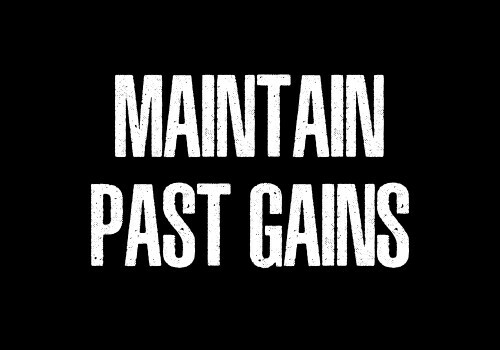 Instead, recognize that gains don’t come as fast to seasoned athletes and lifters, but also embrace how positive it is to maintain what you’ve already developed. And even if you’re shaking your head at the thought of maintenance, that’s okay because I once thought the same way. Now that I’m older and wiser, I recognize just how important maintenance is. Physically, I still feel like I’m in my twenties and I hope to maintain that feeling into my fifties and beyond. And while that may sound crazy, I’d rather be called crazy than ordinary! Hi Ross, i am in total agreement with you. Now approaching 60 years of training i still give myself challenges every year.I can still pretty much do everything i have always done though in some cases not as many or not as heavy or as fast. Still i have found there are always things we can improve on. Grip strength for one things is something that can still improve when older. As the average person loses a certain amount of muscle mass every year past 40, just maintaining the same level means you are actually continuing to build muscle so that in fact is gaining. Same for strength.My goals now are to become stronger where i can, hold on to what i have for as long as i can, and when the inevitable decline comes make as damn slow as possible. A great boost for me is having friends in their 70s and 80s still training hard and loving it. You’re right; most people don’t see any results because they can’t stick to anything; consistency is key to success in many areas of life; and as a matter of fact you become stronger over the years because of the groove you’ve imprinted in your nervous system, even if you stopped making muscle gains. Bruce Lee said a kick practiced 1,000 times is deadlier than doing 10,000 different kicks.